Please report errors for Windows systems in this thread. Provide a link to the results and the nature of the error. Also please be informative but brief. Try to avoid long quotes from your message window unless someone asks. I assumed the 5.0 units I got were relics but maybe not, as there seems to be some confusion about whether 5.00 is .00 or .01. Anyway in case they\'re current, and because 4/5 crashed and I hadn\'t seen any bug reports about them -- here is where I posted links to my latest bad ones on the old thread. Message 1255 - Posted: 19 Apr 2006, 18:41:29 UTC - in response to Message 1254. I cannot explain to you (yet) why the version number is showing as 5.0. What I can do is show you this post, and this page. Which seem very clear that at least the developers think version 5.01 is what is running in RALPH. When I can get more information about this I will report it. Until then just use the Version 5.01 reporting threads. Message 1264 - Posted: 19 Apr 2006, 23:54:27 UTC - in response to Message 1255. Hi guys. Sorry for the confusion; I spoke too soon. 5.01 didn\'t get activated until a few hours ago. We\'re sending out jobs with the new app now. HM, meanwhile my boxes have already crunched 8 WUs of real 5.01, all looks fine at the moment. Right now this WU is running at about 60% and it looks alive and kicking. I had a couple of crashed 5.0\'s yesterday though http://ralph.bakerlab.org/results.php?userid=585 but they both seems to be flawed anyway. 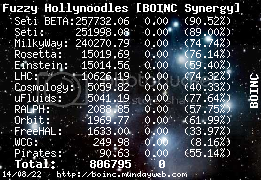 And I upgraded to BOINC client 5.4.4 today. this error appeared when the graphic is shown on screen. I \'ve faced another error like this before this beta version. sorry but i can\'t remember the version. Both were being run on windows xp 64bit. Message 1276 - Posted: 20 Apr 2006, 13:54:02 UTC - in response to Message 1273.
running winxp on p4 3.6 ghz w/ht turned on. it was the last Ralph in my queue, all the others completed fine. Message 1288 - Posted: 21 Apr 2006, 23:44:41 UTC - in response to Message 1284.
mysterious ones -- on some clients they happen over and over again on different kinds of jobs. But your machine has had a lot of successes, and then just this one error, so that indicates that this is problem is cropping up everywhere. Next week, Rom is going to put an update into Boinc that should give more meaningful stacktraces and hopefully let us pin down the problem. The overall error rate for ralph 5.01 has been very low. Is anyone out there seeing stuck jobs (where the graphics no longer updates)?